The full moon of October is called the hunter's moon. In Algonquian it is called the white frost on grass moon. 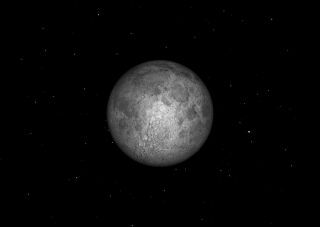 You can have a front-row seat for tonight's (Oct. 29) full moon via a live webcast from the Slooh Space Camera, showing real-time views from an observatory on Spain's Canary Islands. This full moon is called the "Hunter's Moon," named for hunting season, which is ripe now with theleaves falling and the deer fattened after summer. Slooh's "Fright Night" broadcast will begin at 7 p.m. EDT (2300 GMT, or 23:00 UTC). You can watch for free on Slooh's website: http://www.slooh.com. The program will feature not just great views of the cratered moon, but a tour of other celestial "spooky" objects just in time for Halloween. "The Hunter’s Moon will be up that night — a perfect prelude to Halloween, since the moon plays a rich role in Halloween lore," Slooh officials wrote in a statement. "But, unknown to most of the public, other prominent celestial objects are even more deeply associated with 'the darker side' of the night." The space camera will focus in on the Pleiades star cluster, also known as the Seven Sisters, "whose date of midnight culmination was the very origin of the original Black Sabbath, which evolved into All Hallows Eve and ultimately Halloween," according to Slooh officials. "Why was this beautiful blue cluster so associated with death and evil?" The webcast will be hosted by Slooh president Patrick Paolucci, Slooh outreach coordinator Paul Cox, and Astronomy Magazine columnist Bob Berman. The online Slooh Space Camera broadcasts weekly shows highlighting the wonders of the universe. The project launched on Christmas Day of 2003.